I have three SUPER fun cards for you today. My friend Nina never ceases to amaze me in the design department. When I saw the first stamp set I almost died. IT'S SO CUTE!!! IT'S LIKE A PICTURE OF ME AND MADDIE! I DIE OF THE CUTENESS. I always flip Maddie over like this and rub her belly. Splotchy doesn't like being flipped, but Maddie loves it. I stamped the image in Fadeout Ink, and then painted it with Daniel Smith watercolor. Her hair is Aussie-Red Gold, one of my favorite Daniel Smith pigments. The sentiment is stamped in Nocturne. I love how BIG this image is - so fun and easy to paint and so incredibly sweet. Then, as you might have guessed from my title - there's lettuce! And the good news is it's not romaine! Have we all survived #romainepocalypse2018?? I stamped this little guy in Amalgam ink and colored him with Copics. The background is this new Halftone stamp - I LOVE halftone patterns - and I stamped that in Nocturne. I used white and Key Lime cardstock, and I cut his little sign with these awesome nesting stitched dies. Finally, there's a very fluffy kitty in this release, with cookies! I stamped the cookie and crumb image between his paws, because you can tell he has been eating a lot of cookies! He's stamped in Amalgam Ink, and colored with Copics. It's hard to see here, but he's on a stitched circle from these dies. The background is just an abstract watercolor - I wanted him to match the yellow. The sentiment is stamped in Nocturne. Now I don't know about you - but I LOVE small releases like this - better on the old holiday budget. 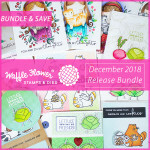 It also makes it easier to buy the whole release if you like it - you can get the release bundle at a discount - all stamps and dies. Here are all the products I used today. Hopefully I didn't forget anything like I did last week. Thanks to everyone who lets me know when I pull an I Love Lucy - I do appreciate it greatly! To celebrate the release, Waffle Flower is giving away $25 gift certificates to THREE lucky winners. You can leave comment on my blog and along the hop by 11:59pm ET on 12/10/18 for your chances to win. Winners will be chosen at random from the comments left on any of the posts on this blog hop and will be announced on the Waffle Flower blog on 12/12/2018. OH and before I go - Nina is having a last chance sale on more than 100 items - 25% off. Click here to shop and use code LASTCHANCE. These are awesome cards. :) Love that cat! 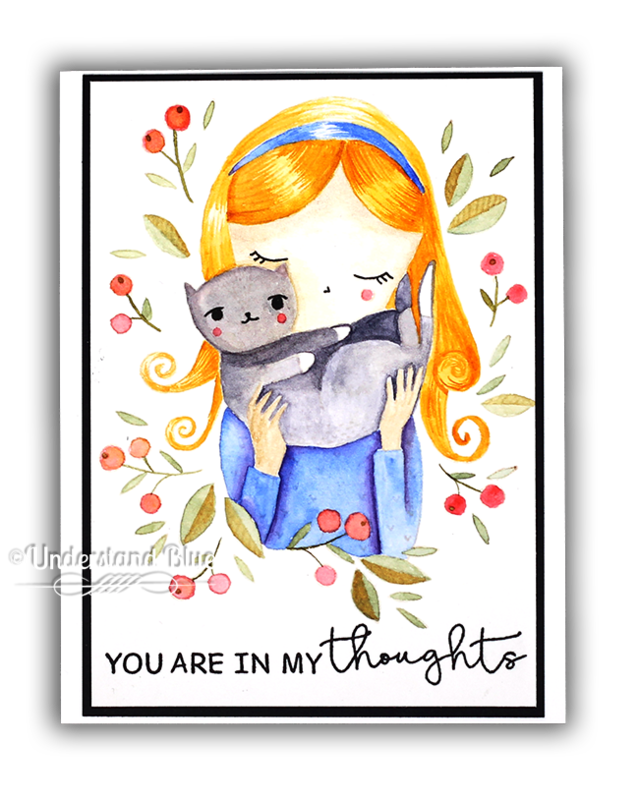 Love your cards from this new Waffle flower release! Great job! Love how you showcased the new release! Great projects! That lettuce stamp is so cute and the halftone background, you can do so much with it. Wow! You have three awesome cards here! I love everything about this new release, especially the kitties! All three are TOO CUTE! I love your no line coloring on the girl and her kitty! Fabulous cards with awesome coloring! I love the image from the Thinking of You set! 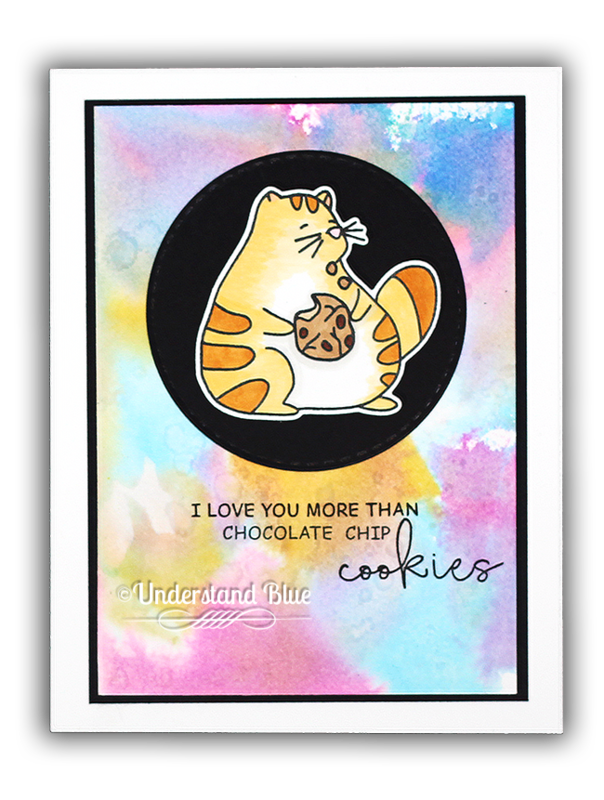 Cute cat in the Cookie Love set also! Love this delightful release! What a sweet release!!! I do love that it's smaller and at a great price point! It's temporarily sold out so I will have to check back. I still haven't made all my birthday/Christmas selections yet! You know I LOVE that sweet girl and her kitty. I really like that the background flowers are part of the entire stamp. 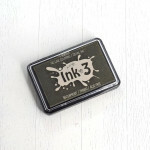 The halftone stamp has so many possibilities! So cool! Loving that fat cat! I am so glad that neither of our cats are overweight but paper cats are adorable size large! Fabulous cards! Terrific cards. I especially like the one with the cat and the chocolate chip cookie. It is adorable. Thanks for creating so many amazing cards to inspire us. Oh my! How sweet!!! Your colouring is pretty amazing!!! Amazing cards! I totally cracked up with your lettuce joke. The little lettuce guys are so cute! These three sets are so adorable and your cards have showcased them beautifully. The halftone stamp is fab. Love, love, love the no line water coloring; sooo pretty! I love that darling set. The halftone BG stamp is awesome! And that fat cat ... hysterical and I adore him! Oh my gosh!! The cookie cat IS Opie!!!! So cute! I love that chubby kitty. Love your cards Lydia and I also love this release. The girl with the cat caught my eye first. I didn't realize how large it is til I saw your card, great for watercoloring. The cat with the cookies rang close to home for me. We have an orange tabby that is a little portly so I'll be getting that one too. Wow these are cute as can be! Fabulous cards! You've the coloured the girl and her cat so beautifully. I love the punny lettuces! These are so adorable. I cannot tell you! I want them all. Btw none of our 20 plus cats would have enjoyed being held that way! These are SO SWEET! Maddie AND Lydia AND bib lettuce AND a cookie in one post? What did we do to deserve this? Awesome cards! LOVE your coloring! Yep, there's everything to love about this release and your cards. Also, I didn't realize, but one of my nieces has Aussie Red Gold hair! I've been thinking about getting that color, but this might just cinch it. I always enjoy seeing your color choices and how you look at products. Thanks for sharing with us! Loving your cards and your coloring! Fabulous card designs and great colors. AWK!!! These are the cutest cards and oh my yes..that kitty looks like he loves his cookies! 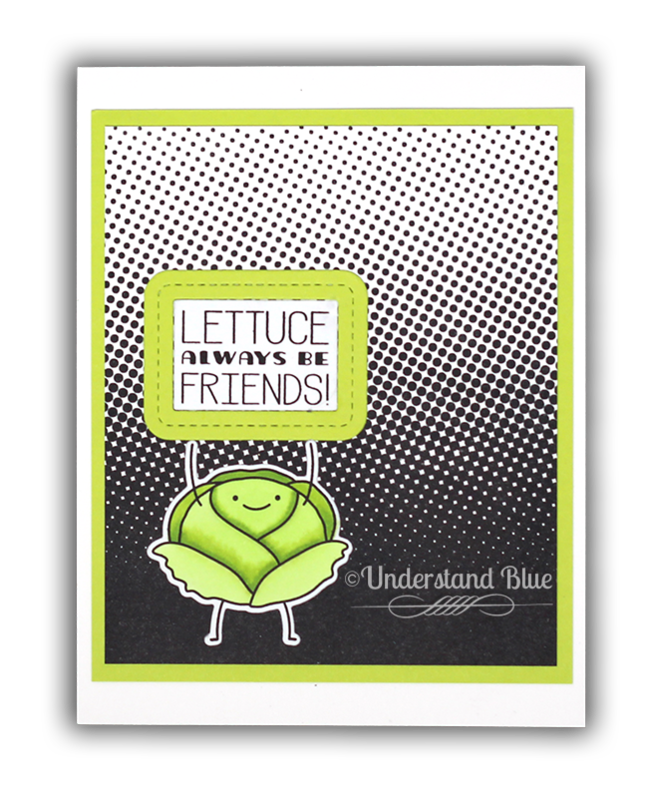 Fun cards...love the no line colouring on the first, cute lettuce and wonderful background on the last. This whole release is wonderful. I really love that fat cat with the cookies though. It’s exactly how I feel!! Love how you did this with no lines...stunning!